Erik’s life of service began at a young age, when he became a Boy Scout. During his time as a Boy Scout, Erik enjoyed the first aid lessons he received, and he developed a passion for helping others. Currently, Erik holds the honor of being an Eagle Scout. At the age of 16 he became a Cadet at his local fire department, and became an EMT at age 18. In 2007, Erik continued his education and became a Paramedic. Today, he possesses the skills and knowledge necessary to manage critical patients between hospitals, specialty referral centers, and extended care facilities. Erik joined Community Care Ambulance in 2017 as a Paramedic. He has been nominated as a Star of Life for his exemplary customer service and documentation skills. 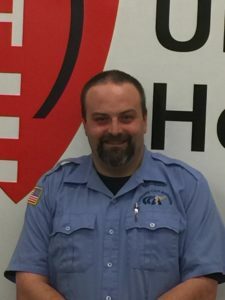 Erik has profound respect for EMS and he demonstrates it on a daily basis through his interactions with patients, customers, and coworkers. Erik also writes extremely good patient reports, which are so well done that we now use one of his reports in documentation class to teach new employees how to write correct reports. Well written documentation is so vital for all aspects of patient care, from complete medical records, proper billing, and support of the organization. Erik is a great source of information. He is always available to answer questions and he encourages others to become more involved in EMS and CCA. Even when he is not on the clock, Erik’s priority is always helping others. One day, after his shift, he was on his way to eat when he came across a man who had been in a motor vehicle accident. Without hesitation, Erik quickly helped pull the driver from his burning car. Erik is always thinking of others, and he demonstrated that during this off-duty response. During his time off, Erik enjoys spending time with his wife and six children – ages 19, 17, 15, 13, 10, and 6. They enjoy backpacking, fishing, and hunting. Erik also enjoys reading and watching cartoons. He is a highly skilled Paramedic who provides quality clinical care to all of his patients, which is why he is a 2018 Star of Life.